I received an advance copy of Dirt! 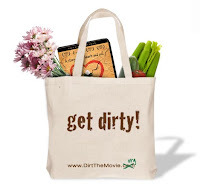 The Movie a few weeks ago and sat down recently with the kids to watch it and see what they had to say about one of our favorite things, dirt. For me, I love dirt because I get a huge kick out of growing food in it and, for my kids, they love dirt because there's so much fun to have with it. This documentary about the value of our topsoil, its necessity for life and how precious and valuable it is, started off a tad slow and I figured I was in for the long haul. Narrated by Jamie Lee Curtis, it picked up quickly and I was impressed by how much they were able to cover. The content ranged from the disappearing topsoil due to industrial farming practices, to climate change and desertification of farmland to death from warfare over arable land. In between, they livened up the discussion by using an animated character my kids called "dirt guy", who they couldn't wait to pop up again (in actuality his name is "Digby"). By the end of the movie, I was extremely impressed by all that they covered and really ended up loving it. Which is hard to do. But, then again, it was hitting all my buttons. I would love to have portions of this movie screened at my kids' school. I know they are working on an educational version of the film, which would be necessary as they really would need to cut the sections showing the death resulting from desertification and warfare as I'm sure some parents would complain. I think it's reasonable, but some kids are very sensitive to that sort of thing. Otherwise, it really appeals to both adults and kids and is extremely educational. My kids actually were commenting on how they now understand better all the things I'm always telling them about the value of food and how lucky they are. Sometimes the visual message is much more effective than a verbal one. Anyway, I'm going to out on a limb here and say that everyone should watch this film. It's that important. If you are interested in seeing this movie, I'm hosting a giveaway for a copy of the DVD and a tote bag. So, if you would like to enter the giveaway, add your name to the comments of this post! You have until April 6th (the release date) at midnight PST to enter. Small print: I have in no way been compensated for this review, save for the copy of the DVD for viewing. The opinions expressed are my own and are in no way influenced by the producers of this film. OH, oh, i LOVE DIRT! I used to have a bumper sticker that said "don't treat your soil like dirt"
Count me in!!! One day I will win one of your contest. I would love to win, and to share with the local library! I am a recent transplant (pun of course intended), but I have already learned how much BI (Bainbridge Island) is proud of and protective of its fertile soil! I would love to win a copy of this documentary! Sign me up! I'd love to see this film! I'd love to see this movie. Put my name in the hat. sweet! I've totally been wanting to see this. Thanks for the chance to win! Put my name in the hat please! Mine would be donated to the library too, especially as they can't get a lot of US based indies over here. Sign me up please! Can't wait to see this. Please put my name down - our family would love this! I'm in. I'm often dirty. This looks like a great movie! Count me in! I'd love to see this movie - thanks! Yes, please, I would like to see this movie. I'm in, I want to see this movie! Would love to see it,if open to Canadian residents. Sounds like a good movie. I would love to show it to my kids. Excellent dirt on Dirt! I'm in. Please put my name in, too! Thanks reminding me about this movie. Hope Netflix will offer it. Wow. Even the trailer is powerful! I'd love a copy of this DVD. This sounds interesting and I could watch it with my kids! I'd love to see this too. Please count me in. After I've seen it and shared it with any friends/family who want to watch it, I'd give it to the library if I win. And another tote bag is always welcome. Thanks for the chance to win. It is such a good movie! I was lucky enough to get to see it a few months ago and I would love to be able to show it to the rest of my family. Oh, I would love to win that! Count me in! Me, me, me! I'd love to see that and share it with my whole world! I'd love to see this! I'm a total dirt loving tree hugger - and my children are on board, too. I do hope that an educational version of this becomes available - are you able to give the producers/distributors that feedback? I've been anxiously awaiting this movie's release! Can't wait to see it! What a great giveaway! I'm totally intrigued by this movie. This sounds interesting, I'd love to see it! I am thrilled that these informative movies keep coming out. I could add it to my copy of Food Inc.; another GREAT film! Dirt is pretty spectacular. And I like the idea Anna said about sharing it with the public library. i love dirt. Just took a enviormental geology course and learned about topsoil. 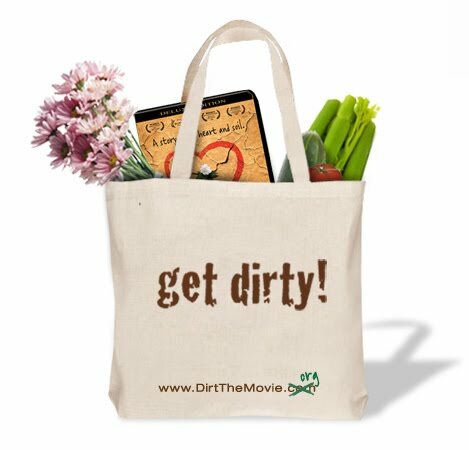 just came in from spreading around my compost aka homemade dirt and I see a giveaway for the movie Dirt! Yes, please count me in for the giveaway. We love these kinds of films. Add a little environment and a little messy... and let's just say I'm really crossing my fingers for this one. Thanks! My grandmother was very anti-dirt. "Don't be tracking dirt in the house." My mom - the exact opposite. "Don't worry it's good clean dirt." I am a clean dirt fan! I would love to see this movie AND I would show it to all my fellow community gardeners. I would seriously love a copy! Mmmm... there is nothing nicer than fresh dirt after an April rain. Smells like green. Count me in - I'm so looking forward to seeing this film! And hoping to get my first fruits and veggies of the season planted this week - sure hope this weird hail/snow/cold front thing leaves the Seattle area soon! New reader :) I wandered over here from Angry Chicken. I'm particularly interested in your blog because I am moving to Seattle in just a few months and am a little worried about keeping my semi-rural, semi-hippie lifestyle going in the middle of Seattle. Eep! enter me enter me!!! I love Dirt! ME ME ME! I love dirt. Sounds like just the scoop for our family! Sounds fascinating! I would definitely enjoy seeing it. I love worms so naturally dirt goes with them. Count me in! I'd love to win a copy. It's so hard to get it in stores here and buying online is too expensive because of the exchange rate. Me too, me too! If I win, I'll share with our Sustainable Burien group. 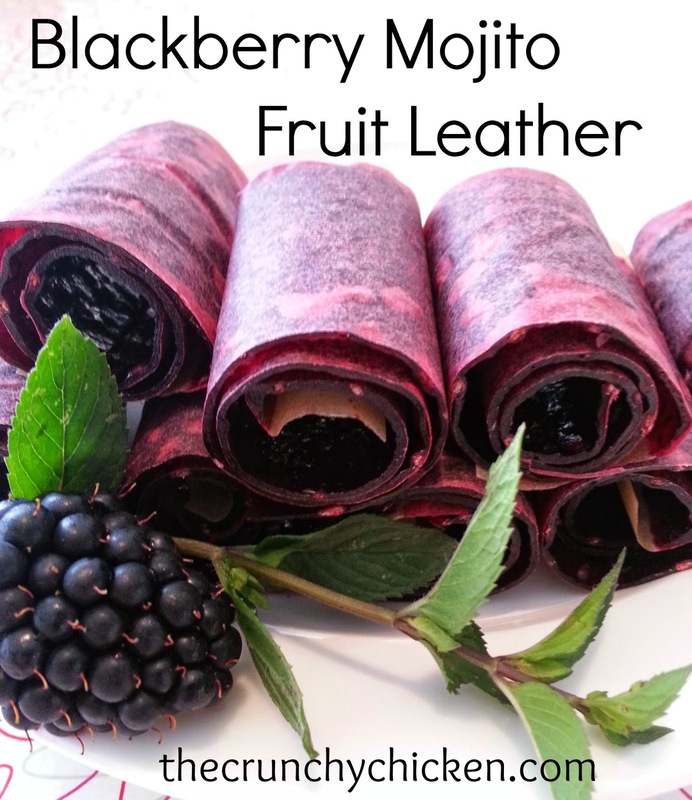 Just discovered your blog this morning and am really looking forward to keeping up with you! Hopefully my memory serves me, but I think David Suzuki (in Sacred Balance) said that it takes 300 years for the Earth to develop an inch of topsoil. Whatever the timeframe was, it floored me...how much we take dirt for granted. Thanks for posting this giveaway, Deanna. I'd love to see the movie! Sign me up...I'd love to see this film! Sign me up as well, please! I've been reading all over your blog and love it!! Besides, I finally got my DH to watch documentaries with me, and this one looks excellent! Count me in! This movie sounds very interesting! I love documentaries and can't wait to watch this one!